If you’re having issues with your WordPress site, one potential fix is to reinstall WordPress to make sure the issue isn’t caused by any corrupt files. Done right, this ensures you have clean core WordPress files without affecting your existing content. Or, if you want to restart your WordPress site from a completely blank slate, you might want to entirely nuke your existing WordPress site and reinstall a fresh copy of WordPress to start from scratch. Whether you want to completely reinstall WordPress or just reinstall the core WordPress software without affecting your existing content, we’ve got you covered in this post. The only thing we ask is that you take a backup before following any of these methods. 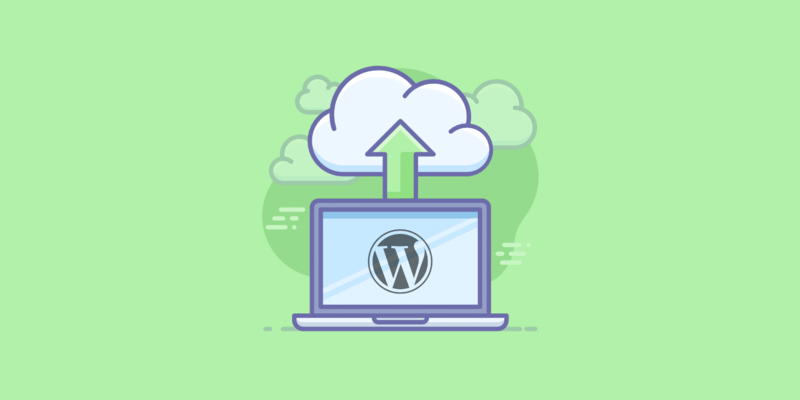 Even though the first two methods are geared at helping you reinstall WordPress without losing any content, it’s always a good idea to have a fresh backup just in case something goes wrong! If you are a Kinsta client, you can quickly take a WordPress backup with a single-click. 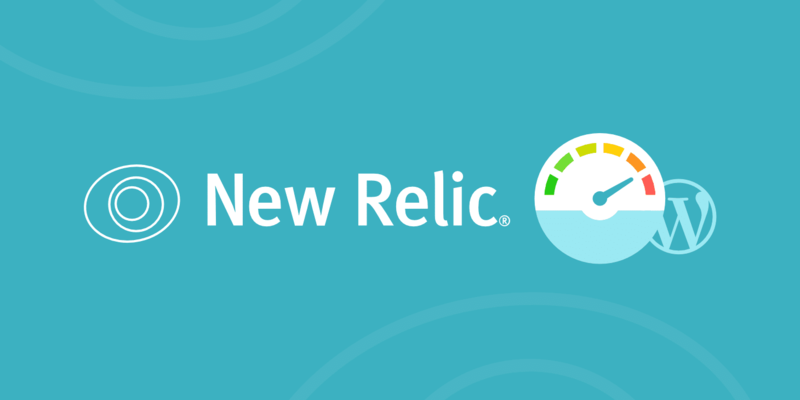 Tired of WordPress hosting support that seems to know less than you do? We understand! That’s why Kinsta only employs high-skilled developers and Linux Engineers. The expertise of our support department is second to none, and we’re available 24x7 to help! Each method only reinstalls the core WordPress software. If you just want to reinstall the core WordPress files, you can actually do it right from your WordPress dashboard (if you can’t access your WordPress dashboard – you should skip ahead to the next section for how to do the same thing via FTP!). 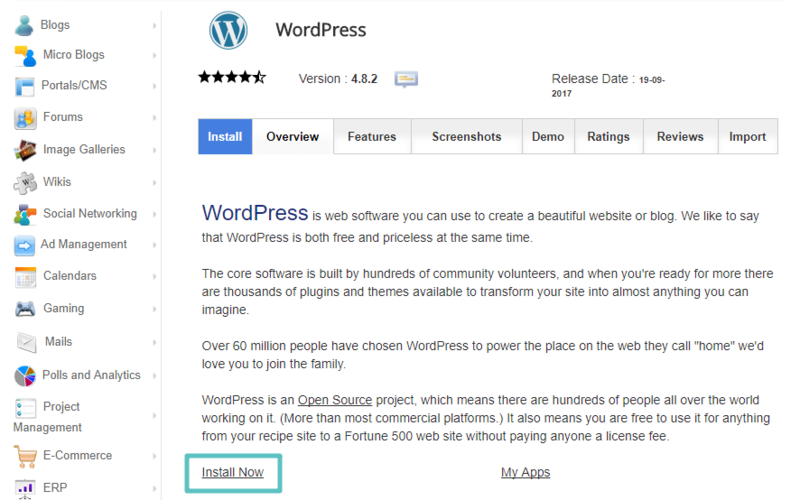 Once you click the button, WordPress will automatically download and reinstall the latest version of WordPress. You’re essentially just manually re-running the normal Update process that WordPress performs when you update WordPress from your dashboard. 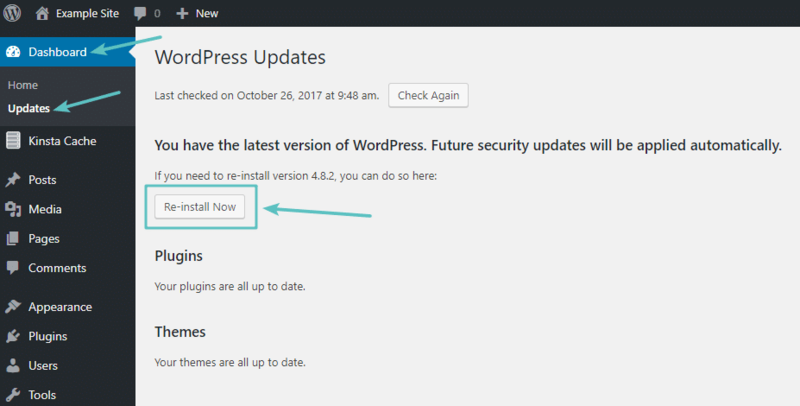 It might take a few seconds – but once the process finishes, you should have a fresh copy of WordPress installed. If you can’t access your WordPress dashboard because of an error (or just prefer to work over FTP), you can perform a similar process via FTP. You’ll basically be manually duplicating what WordPress would otherwise do for you in the section above. 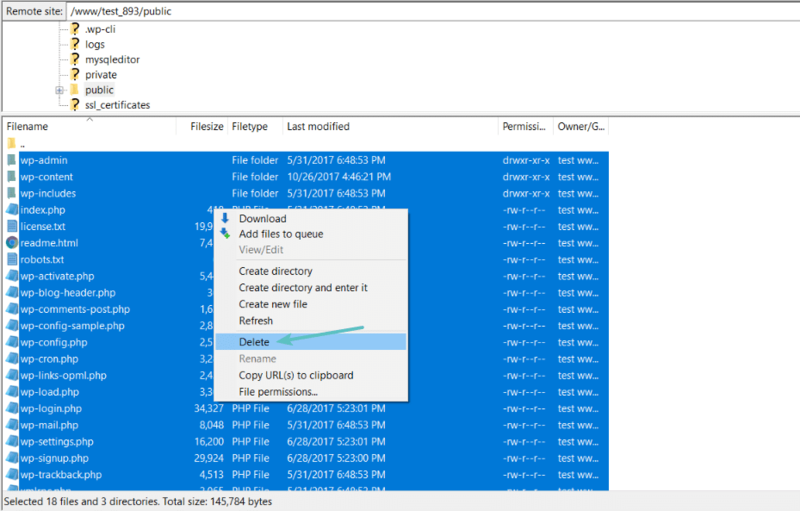 Once the download finishes, extract the full contents of the ZIP file to your computer. Then, delete the wp-content folder. 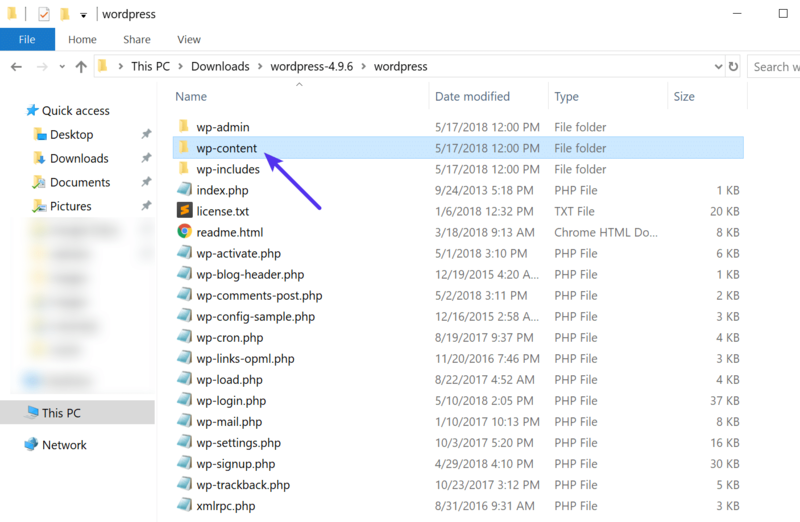 Once you’ve done that, connect to your host via FTP and upload the remaining files to the folder where you originally installed WordPress. Usually, this is your root folder named something like public or public_html. 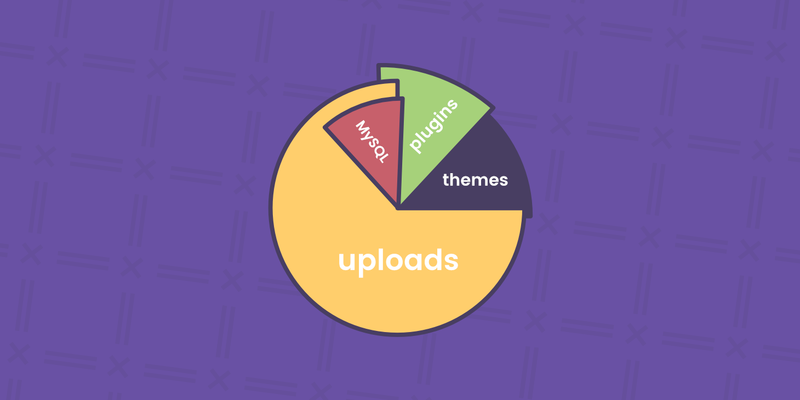 Because you already deleted the wp-content folder, this will overwrite all of the core WordPress files without affecting any of your themes or plugins. Once the upload finishes, you should have a freshly installed copy of the WordPress core files and things are hopefully running smoothly. You can also reinstall WordPress core using WP-CLI. WP-CLI is a command line tool for managing many-many aspects of a WordPress installation. It can add/remove users, posts, categories, insert test data, search and replace in the database, and much more. The following command would download WordPress core without the default themes and plugins. Read more about WP-CLI commands. Important: If you follow this method, you will lose all of your existing content. this section deals with uninstalling WordPress and installing a fresh, 100% blank copy. If it sounds straightforward, that’s because it is! To delete all of your existing files, you can connect to your site via FTP or, if your host uses cPanel, via cPanel File Manager. Once you finish installing a fresh copy of WordPress, you can start building your new site from an entirely blank slate. At this point, you can install a fresh copy of the theme or plugin like you normally would. It should function the same as before and retain all of your previous settings and configurations. Re-uploading the latest copy of WordPress to your server, excluding the wp-content folder and wp-config-sample.php file. And install a fresh copy of WordPress via whatever method you prefer. Finally, to reinstall a specific theme or plugin, all you need to do is rename the existing folder via FTP and install a fresh copy like you normally would. Very complete and detailed guide! We’ve updated the instructions above. WordPress.org doesn’t contain a wp-config.php file, so you don’t have to worry about that. And the wp-config-sample.php isn’t used. Hey. My website just experienced a malware attack so i plan on doing an uninstall and reinstall. I have compared your method with that of others and I noticed you didn’t mention anything about exporting content. I hope following your method would not make me lose my post content, categories and user data. Hey Toheeb. Many of the options above show how to reinstall WordPress while maintaining your existing content. Hopefully one will work for you! -downloaded wordpress, replace “wp-config-sample.php” to “wp-config.php” and added old-same database credentials. -Uploaded wordpress to “blog”, and copied/moved the uploads folder “blog2/wp-content/uploads” to “blog/wp-content/uploads” (move in ftp o filemanager is faster than copy) because in uploads where are all my images.